When Fred Haberman arrived late for work. Lake of the Isles had called that morning... loudly. There were guys on the hockey rink and there was no way he was going to miss a game on the pond. Wondering aloud as he entered the office "Why isn't there some sort of Pond Hockey tournament here? You should have seen me dangling out there! I'd probably win...no, I'd definitely win!" So, we looked into it. Looked good and now, thirteen years later it's part of hockey history. Not just here in Minnesota, no - globally. 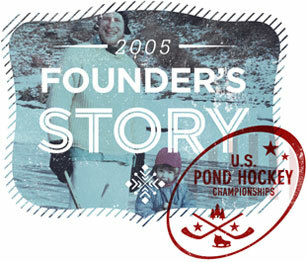 Pond hockey combines the passion of a simple childhood memory and the strength of community spirit. Players from around the world have played in the U.S. Pond Hockey Championships and they have told their friends about it. 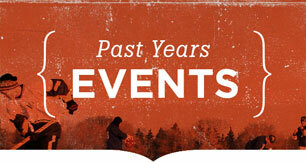 …and for a Weekend, Time Stands Still. Our goal is to celebrate the joy of hockey "the way nature intended" on a Minneapolis lake each January with players reuniting with their youth and friends over a weekend when time can stand still and we can all be kids for three days. 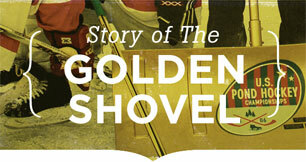 The champions do not win prizes, but go down in history with their names etched into the Golden Shovel, a symbol of our lifelong love and passion for the purity of this outdoor game. The USPHC has become an annual pilgrimage for thousands, and every year pond hockey history is once again etched into the frozen surface of Lake Nokomis. Oh, and...Fred hasn't won yet.